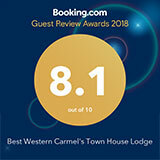 Sign up now to receive email offers from Best Western Carmel's Town House Lodge. Hear about amazing vacation deals to Carmel-by-the-Sea and Monterey Bay. We'll keep you posted with our latest vacation deals, available only to our online family. Please fill out the secure form below so we can get to know you better. We promise not to share your information. Thank you!